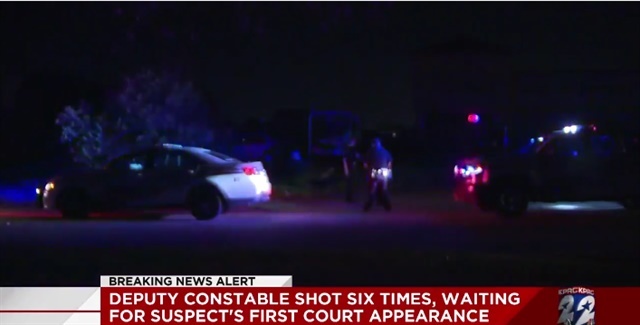 A Harris County, TX, Precinct 4 deputy constable was shot several times Sunday evening, according to officials. A spokesman for the Harris County Sheriff's Office said that the deputy constable, identified by Precinct 4 Constable Mark Herman as Justin Gay, went to a home after a call about a domestic dispute. As Gay tried to take someone into custody, shots were fired. “There was an altercation between he (Gay) and the suspect and during that time the suspect pulled a gun and shot six to seven times at Deputy Gay,” Herman said. Gay was shot six times in the legs, and was listed in stable condition at Memorial Hermann Hospital, Herman said. He said Gay will require several extensive surgeries on the road to recovery. The sheriff's office posted to social media that Constantine Argyriou, 40, is in custody. He was taken to a hospital and treated for bites sustained by a Police K-9. Argyriou is charged with attempted capital murder of a peace officer, Click2Houston reports.